Sometimes, it’s hard to get access to a scratching post as soon as you need one. An old one breaks, you’re in a hurry, and you just need kitty to be set in terms of scratching until you have the time to pop into the pet store, or wait out the long shipping date it takes to get a nice new cat tree. Other times, it’s really not practical to have a scratching post in every single room of the house that kitty uses. Of course any cat will still want to scratch in every room, but then kitty’s just taking out his or her claws on the poor furniture. What can you do? 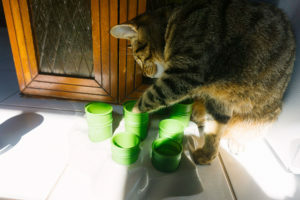 There are actually plenty of everyday objects that your cat will happily take his or her claws to – so you don’t have to grab that extra scratching post if you don’t want it around. You can use these alternatives as your main scratching posts (which is what I’ve done – I’ll explain later), or you can use them alongside regular scratching posts, scratch pads, and cat trees. 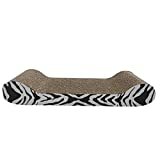 Having at least one or two of these “approved alternative scratching posts” in every room will make it so that kitty knows that if there’s an itch to get those claws scratching, there’s plenty of a-okay items to take it out on. 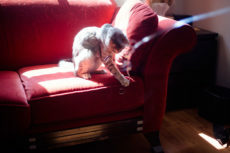 Hopefully, having these approved scratching objects means your cat will be giving your new sofa a rest with the subtle torture, but if not, at least over time and with a little training, your furniture should be safe from those sharp kitty claws. Okay, so what are these alternatives? This is quite literally the number one best alternative to a scratching post. 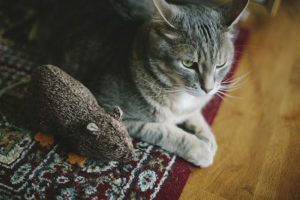 And I know, you probably don’t want your cat on your nice rugs in the first place, but hear me out when I say, it’s often not worth the fight over keeping the rugs in your house safe from kitty’s claws. 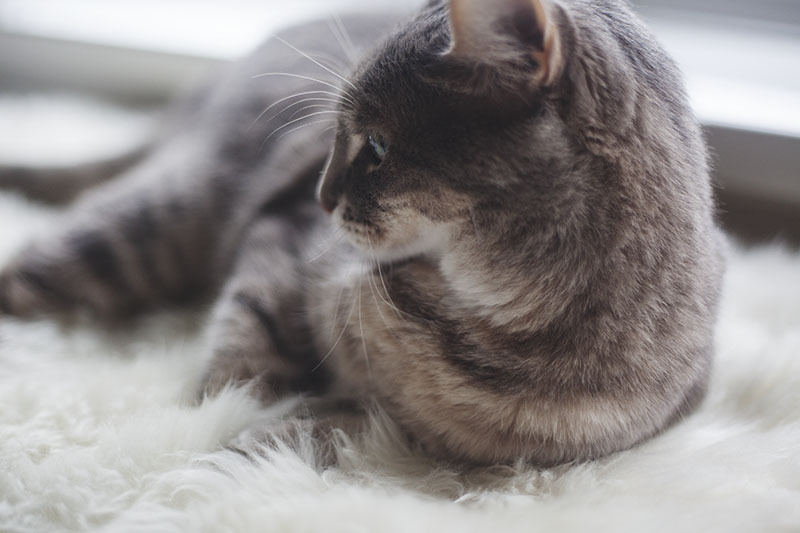 Your cat probably already loves scratching on your rugs, and if he/she isn’t doing it while you’re around, there’s a very good chance he/she is doing it when you’re not around. 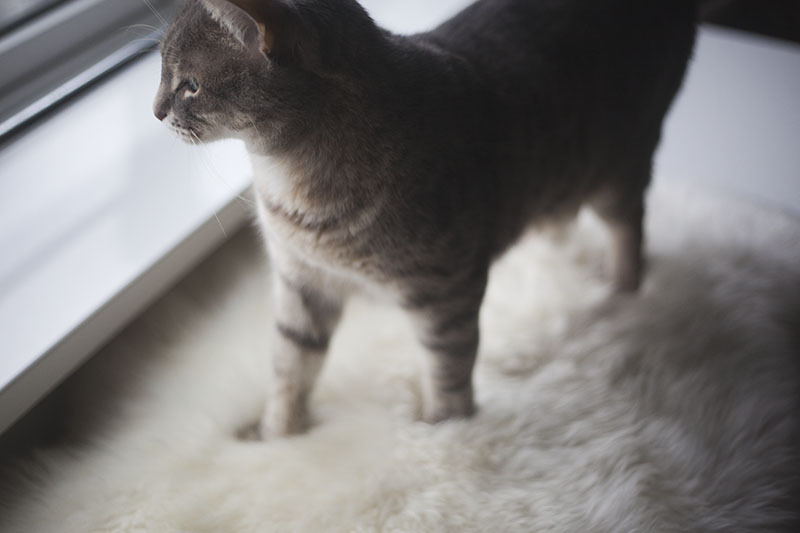 If you have expensive, high quality rugs, odds are high that your cat’s scratching on your rugs will not actually damage them. My grandmother got me a Persian rug (straight from Lebanon!) that lasted years of torment from my kitty, Avery, with absolutely no visible damage done to the carpet whatsoever. We left that rug in Canada when we moved to the UK last May, but you can bet that rug will be on one of the first or second trips back with us when we go back to Canada to visit. It’s just such a nice thing to have – a high quality rug that won’t be damaged no matter how much claw action your cat takes out on it. Still worried your high-quality rug will be damaged? Move it to a room kitty doesn’t frequent, make sure you have an alternative rug that kitty can take his/her claws out on, or just remove the rug completely. But don’t refrain from entertaining the option of using rugs as an alternative to a scratching post just because you don’t want kitty on the rugs you currently have. Work around that issue. Currently, Thomas and I don’t have a lot of space, being in a studio apartment. We started out having a cardboard scratch pad for Avery, specifically the Catit Scratcher for him to use, but because it’s so light, he wouldn’t use it unless I noticed he wanted to and would hold onto it while he scratched away. Cats don’t like scratching on objects that move. So we weighed down the scratcher with an exercise weight and all was fine. He’d use it whenever he needed to. But when we did an Ikea order and ended up grabbing a Valby Rug for our home, things changed. Since getting the rug, he’s sharpened his claws solely on it, and never took a second look at the scratcher. After around a solid month of him ignoring the scratcher completely, I got rid of it. No point in keeping something he was never going to use, and we’re happy to have him wear this rug to pieces, as it’s easy to replace with a new one from Ikea. I’d suggest you do the same. 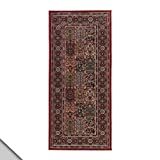 If you don’t have much space in your house for rugs, get a small one. 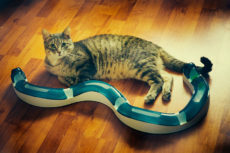 Your cat won’t mind, as long as it doesn’t wiggle around that is. Which brings me to my next point. Have tile, laminate, vinyl, or hardwood floors? Get an anti-slip underlay if you’re going to try having a rug or two as a scratching post alternative. The one from Ikea (the STOPP-Anti-slip underlay) works really well for us on vinyl, and I’m sure it would do the same on tile, laminate, and hardwood. 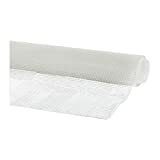 Finding an underlay that doesn’t let the rug move when you’re cat is scratching is extremely important, as – like I said about my Catit scratching pad before – your cat will only like scratching if the item he/she is scratching on does not move. And there’s no point in a scratching post alternative that your cat doesn’t want to scratch on. If you’re okay with your cat scratching up the carpet, and feel it’s a lot better than the alternative (for him/her to scratch up everything else! 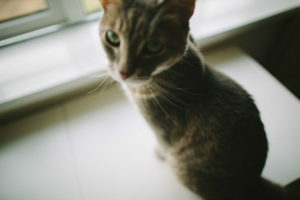 ), consider only shooing kitty when he/she scratches the furniture and not when kitty’s scratching on the floor. 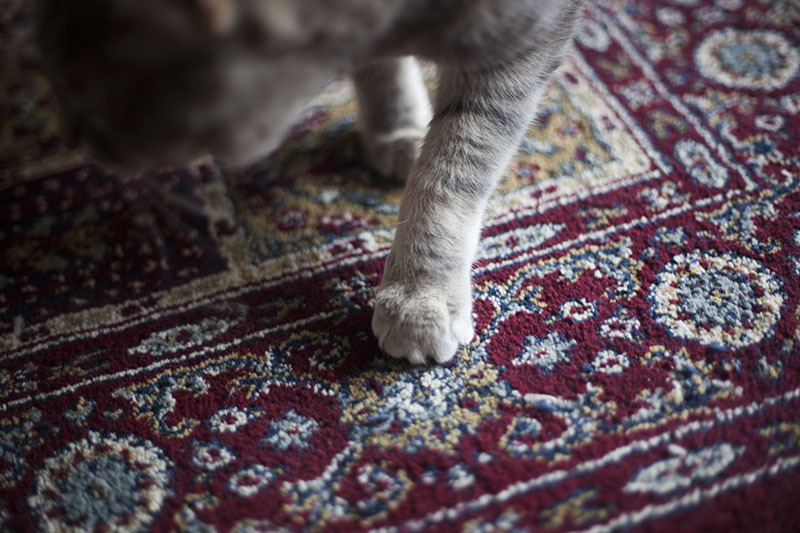 If you can’t stand the idea of kitty scratching up your carpet, there’s always the great option of putting a rug or two right on top of your carpet – ones that are approved for kitty claws. Or, of course, get another scratching post or use one of the other alternative scratch items on this list. Now, I haven’t tried using feau furs, but I have tried using genuine sheepskin hides. Again with Ikea coming to the rescue, I decided to add a Rens white sheepskin to my cart alongside the rug the last time I checked out. Avery’s quite literally used the sheepskin to knead on every day since it’s arrived. 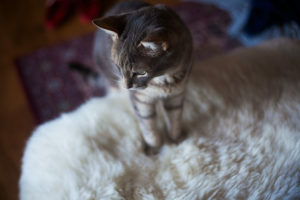 He uses the sheepskin just as much as he uses the rug – though definitely as a secondary scratch post (rug takes the cake for him being able to stretch while he has a good scratch). Every night, and whenever we binge-watch TV shows from bed on Netflix, we move the sheepskin from the dresser to the end of the bed. Why? Avery’s grown dependent on kneading on it for a good 3-4 minutes before coming to snuggle with us now. He also uses the sheepskin regularly throughout the day to take naps on – again, kneading for a good few minutes before he settles down for a rest. While we use it as a throw or blanket alternative, we could easily use it as a rug, having it on the floor instead. Interestingly, the sheepskin is heavy enough that we don’t need to use an underlay to keep it in place at all, even if we have it on a slippery dresser or the floor for him to use. Avery loves taking his claws to this thing, and while he also loves taking claws to our clothes if we ever leave them on the bed, a quick picking him up and plopping him on this fur will get him to continue kneading in this scratch-appropriate location instead. No matter how much he uses the sheepskin, no damage seems to occur. I thought that chunks of fur would start coming off a bit at a time, and that it would eventually have to be replaced, but that hasn’t happened yet at all. So good considering it’s one of the few items he can scratch on as much as he likes without it eventually falling to pieces. I’ve not yet tried tried using any other kinds of furs, though I’m hoping to get a nice long-haired goat fur eventually to give a shot and see if he likes it. I’m not sure cow hides would work as well as sheepskins because I do notice there’s something magical about long fluffy wool that cats go crazy for. That would lend me to believe that sheep and goat hides/furs will work out better for this purpose. That being said, I won’t hesitate to try other options once I have the chance to do so. Again, also haven’t tried using imitation furs, but my guess is that they would work almost as well as the real thing. If you have any experience with cats + feau furs, let me know in the comments! Avery loves kneading in pretty much any wool, so blankets are an excellent alternative to the furs for scratching and kneading in. The tighter the knit, the longer the blanket usually lasts without getting damaged, and the happier kitty seems to be to put his claws all over the item. From a durability perspective, blankets are definitely not as good as any of the aforementioned options, but still the option is viable. Obviously, it’s also much easier and more cost efficient to replace blankets that are damaged than it is to replace scratched up furniture. Same as the blanket section, I’d go with tight-woven high quality wool to get the most durability – but if you’ve got throws around, chances are kitty definitely won’t be able to resist getting claws on them. From kitty’s perspective, neither blankets nor throws would be as good as the fur/hide option for kneading, and certainly not as good as having a rug or two specifically for scratching on. But if you don’t like having any hides or rugs around for a specific room, and yet still want to keep your furniture safe from kitty claws, blankets and throws strewn on furniture your cat already loves scratching up could do the trick perfectly. 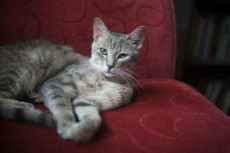 Instead of using the furniture, your cat would likely be drawn to the blanket or throw to get his/her paws on instead. 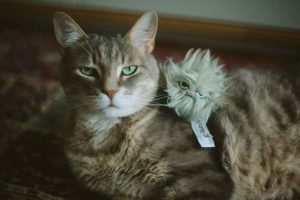 If there are any specific items of clothing that you find kitty is really drawn to kneading in and that you aren’t particularly attached to, consider “donating” these items of clothing to your cat, i.e. leaving them out for him/her to use to claw and sleep in. Items of clothing that might fit this job description perfectly: fleece hoodies, wool sweaters, wool coats, and wool scarves. Make sure your cat knows that this particular clothing item is just for him/her by placing it in a spot he/she frequents. 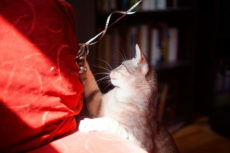 If just having these scratch-approved items in the room is not enough for kitty to stop clawing away at your furniture, whenever you see your cat trying to knead or scratch in the wrong place, gently pick kitty up and plop him or her on a scratch-approved item. Eventually, your cat should begin to understand that there are certain spots kneading and scratching are encouraged in, and others where you’d really rather him/her not scratch. Hopefully, it’ll mean that even when you’re not home, the furniture remains safe. Need more help getting kitty to scratch somewhere besides your furniture? See this article here: My Cat’s Scratching Furniture! How Can I Keep Claws Off the Couch? What Other Scratching Post Alternatives Can You Think Of? Have I missed any everyday items that cats absolutely love getting their paws on? 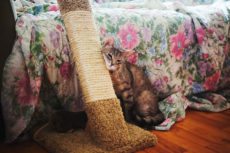 Have you ever tried using rugs and carpets or furs as a replacement for scratching posts, scratch pads, and cat trees? Ever tried using them to increase the number of items your cat has to use his/her nails on? Tell me in the comments down below! Haha too true! My cat doesn’t scratch on boxes, but I know many that do. They just can’t resist haha. Carpeted trees are awesome for scratching, for sure. Not bad wear and tear on the rug if you only have to cut the outer layer off around once a year!